Quietly, I’m opening my head and driving the world out. 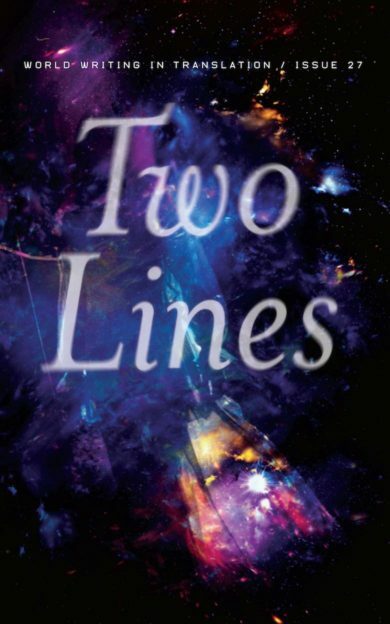 Two Lines is, as all publishing is—and especially as all international, literary publishing is—a political act. And many of the poems and stories in this issue touch, obliquely, metaphorically, or specifically, on politics from around the world. And that is something we are alway trying to do: widen the political perspective by including views from all over the world in this, whether you like it or not, irreversibly globalizing age. Perhaps it’s naive, but I do believe that if I occasionally “open my head and drive the world out,” it might just seep back in a little more humbly and honestly. "I open the door crying and it falls at my feet : it comes to..." | To. | the smiling white swan on the white beach towel = Scardanelli Version | "then suddenly everything stops the lark daffodil the..."